Slot games come in a wide range of themes and none are quite so exciting as the Shaman’s Dream slot. This adventure themed game will take you on a journey to find your totem and hopefully this will bring you some luck too. It’s one of the most visually exciting games on the internet! This game has a distinctive theme and each possible space on the reels is covered with another symbol that goes along with it. This gives the game a very complete, high quality feel. You’ll see the mystical Shaman, spirit animals, feathers and other symbols associated with this culture. There are five reels and three rows to play on with this game, the paylines on it are also adjustable. This gives you plenty of choice in how much you want to wager on the Shaman's Dream slot machine. It really is for players with any size of budget! The reels have a rustic feel and are made of wood, with feathers denoting each of the paylines. Once you’ve sorted out your bet, there’s nothing else to do but spin those reels. This game also comes with an autoplay function, should you wish to have the game do the spinning for you. There’s also a gamble feature that you can activate after any winning spin. This gives you the option to risk your bet for the chance to win more, though if you lose then you’ll lose your entire jackpot. It’s up to you if you feel lucky enough to chance it! It’s up to you to match up three of a kind with this game across your active paylines to win. The Shaman's Dream slot contains a paytable that will tell you everything you need to know about the value of these symbols too. They range from the lower value ones like the axes to the higher ones like the wild. They can all add multipliers to your bet, so the more you wager the more you stand to win! 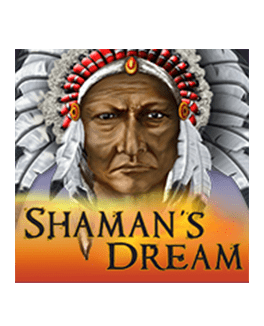 The wild symbol is truly wild within the Shaman's Dream slot game as this symbol is a white wolf. With five of these by your side, you will win the biggest multiplier in the game. It can also help you out by joining in on other symbol combinations, as it can stand in for everything but the bonus symbol. The aforementioned bonus symbol is displayed as a dreamcatcher, which will help you achieve your dreams of free spins. You just need to get three of these to start this bonus feature and then the fun will really begin. The game will start to spin for free and you will just rake in the jackpots. 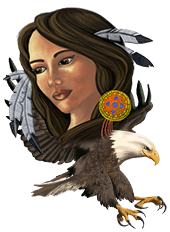 You can win up to 25 spins with these symbols, which can turn into some hefty jackpots for you.We’re one of the very best casino sites with Shaman’s Dream that you can play on, so don’t hesitate to get spinning! We’ll reward you with loads of perks when you play with us, so don’t miss out.